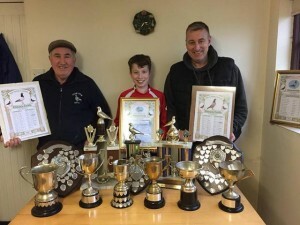 F & J & G Dickey Highest Prize-winners and winner of 13 x 1sts. F J & G Dickey team were Highest Prize-winners winning 13 races. Also collecting Old bird Inland Average, Young Bird Average, Loft Points Channel, Loft Points old bird Combined, Loft Points young birds, Loft points OB & YB Combined, Single Bird points inland, Single Bird Points channel, Old bird combined, and Old bird of the Year.